Vancouver restaurants have been calling for new and young generation to join the industry. The Chinese Restaurant Awards present another experience-driven dining concept called the “Dining, by Award Winning Chefs” with the goals to create opportunity for creative and skill exchanges among chefs and inspire the new chefs and those who have the interest to develop a career in the Chinese restaurant industry. The first “Dining, by Award Winning Chefs” event brought together four recognized Chinese head chefs and a young Chef team to prepare a 10-course refined and traditional Cantonese menu exclusively for only 30 diners. This event was sold out within three days. All proceeds go to Canadian Cancer Society exclusively. Stay tuned for the announcement of next dining event. All proceeds CAD 15,340 went to Canadian Cancer Society. 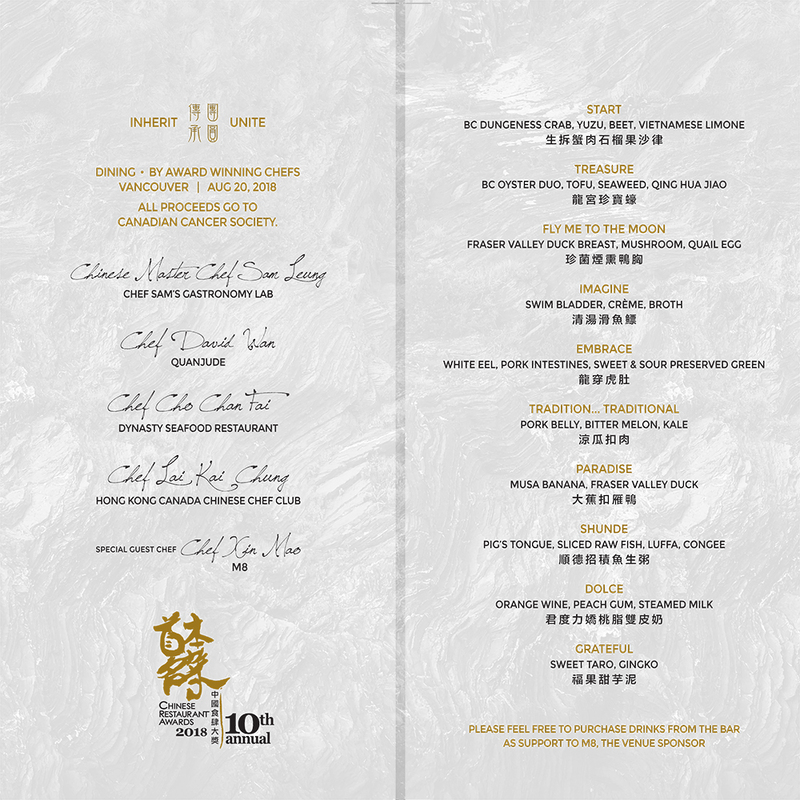 Special thanks to the generous donors, Mr. William Ho Wood Kuen for co-presentation, Chef Sam Leung for sponsorship the cost of food ingredients and Fanny Bay Oysters for sponsoring the oysters for this dinner. Chef Sam Leung started his apprenticeship and learned the basics of Chinese cooking in 1980 at the Guangzhou Restaurant in China. He immigrated to Vancouver in 1985 and served as the head chef at restaurants such as East Lake, Floata and Dynasty Seafood Restaurant. Chef Leung has reinvented numerous Cantonese dishes that are praised by both mainstream and Chinese diners. 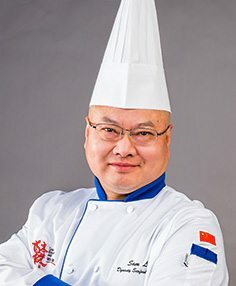 In the past eight years, he has received various accolades including six Critics’ Choice Signature Dish Awards from the Chinese Restaurant Awards. In recognition of his achievements, the Awards bestow on him the title of “Chinese Master Chef” in 2017.